Good Day To Go Fishing? 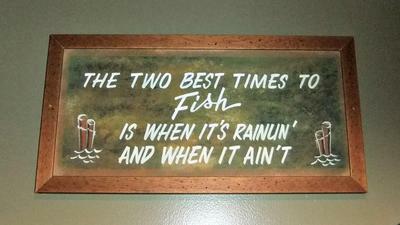 "The Two Best Times To Fish Is When It's Rainun' And When It Ain't"
Is today a good day to go fishing? Yes, of course today is a good day to go fishing. In my opinion, any day is a good day to get out there on the water to fish. But then again, it also depends. If there is a blizzard or a really bad storm, then you obviously should not go fishing... especially if there is lightning strikes! The only exception might be for those commercial fishermen who spend their time out on the ocean waters weeks and months at a time, like those crazy committed fishermen you may have seen on the Deadliest Catch television show hosted on the cable network Discovery channel. As for myself, I try to get out on the water as often as I can. Depending on the time of year, and even certain times of the day, I will fish for whatever should be biting during that time. But like I mentioned above, there are factors involved. For me, I'll go pond fishing for largemouth bass, bluegill, trout or even trash fish like carp. I enjoy fishing lakes during the warmer months, mainly for largemouths, smallies or trout. Or I'll pick any other day throughout the year, rain or shine, as a good day to go fishing in rivers, sloughs and creek beds for striped bass, largemouth bass, pan fish and catfish. If there is a specific species of freshwater fish that that you plan on targeting, you can use the navigational links on the left hand side to discover more fishing techniques of how to catch those fish. You also could check out this quick access guide of freshwater fishing tips as well. Hope this helps. Feel free to post any other questions you might have that's related to good days for going fishing here. Comments for Good Day To Go Fishing? Is today a good day to bass fish in south ms? Yup, I think you should get out there and get after those bass. Best of luck to you! Would today be a good day to go cat fishing?